View basket “£5 Gift Voucher” has been added to your basket. Treat them to a Yorkshire Attractions gift voucher to their favourite Yorkshire Attraction so they’ll be spoilt for choice for their next day out! 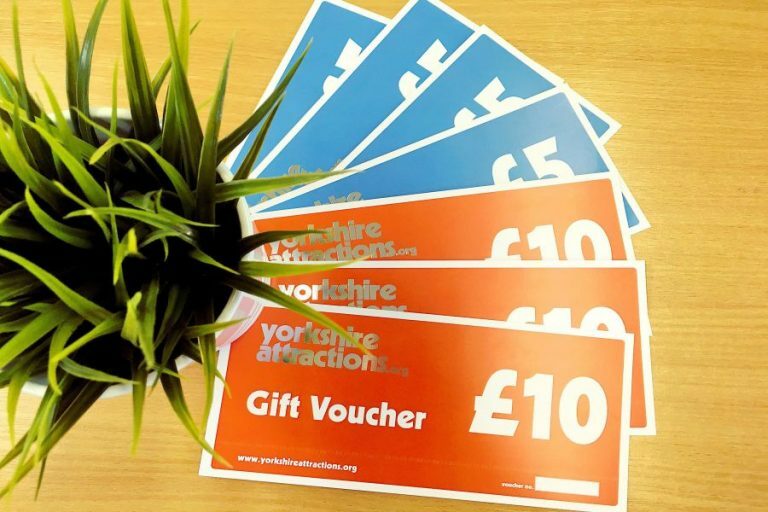 No matter big or small, our Yorkshire Attraction Gift Vouchers are a perfect way to surprise friends and families, or even surprise a colleague or two! Gift Vouchers are supplied in a presentation wallet and are valid for up to a year from date of purchase. Gift Vouchers can be ordered online through PayPal and can be sent directly to the recipient’s address. Visitors are reminded to check with the attraction they wish to visit in advance to avoid disappointment. Please note the list of attractions below that accept Gift Vouchers can be subject to change. Please note ALL attractions not listed here, do not accept gift vouchers. For full Terms and Conditions on Gift Vouchers, please click here.